A wheelchair is a chair with Wheels that is designed to carry people who have lost the temporary or permanent use of their limbs. Wheelchairs come in very handy in emergency situations when a person has passed out or is too sick to walk on his own, it also helps people who are paralyzed, or aged to move about freely. There has been an influx of different brands of wheelchairs in the market, therefore making the right choice of which one to buy especially in emergency situations can be really challenging. A very trustworthy brand of wheelchairs available today is the Medline Wheelchairs. Medline has carved a niche for itself in the market and has a very good reputation for making strong, durable and comfortable Wheelchairs. 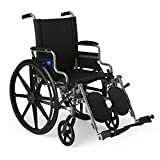 This article will review the top ten Medline wheelchair in 2019. This wheelchair chair also functions as a transport chair. 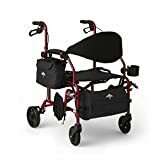 The wheels are quick release, and the rear wheels can be easily removed with just the push of a button thereby making it easily convertible from a wheelchair to a transport chair. It has removable desk length arms that makes it easy for the user to Eat or work on a table. It has anti-tippers that give it stability and prevents the tipping of the chair on rough terrain. The footrest can be adjusted with the push of a button. The legs rest also swings making it easy for people to sit in or get out of it without any challenge. The seat is 16 inches deep and the width is 18 inches. The overall dimension of this wheelchair when it is not folded is 30.5 inches by 26.5 inches by 36.5 inches. It weighs just 33 Pounds and has a maximum weight capacity of about 300 lb. The front wheels are 8 inches large while the rear wheels are 24 inches large. This wheelchair has arms that can swing back and an easy to grip back arm release for Extra Comfort. The hemi-height can be adjusted to be two inches higher or two inches lower with an axel. The axel also makes it easy for the rear wheels to be removed without any told. Sitting at or using a table is made easier because of the Desk-Length Arms that can be flipped back. The leg rests can also be removed for more comfort. The Calphalon and armrests and padded and upholstered, while the seat is made of breathable nylon. The wheels of this wheelchair smooth-rolling and easy to maintain. The movement of the wheels can be powered by foot movement. The seat size is 22 inches by 18 inches. The total dimension of the chair when it is unfolded is 30 inches by 29.5 inches by 38 inches. It weighs 35.5 pounds and has a maximum weight capacity of 350 pounds. This wheelchair has a durable frame and a seat made of nylon. It moves smoothly with the aid of the flat free tires and the height can be adjusted to be two inches higher or two inches lower. The armrests have a desk length thereby making it easy for the user to dine on the table with it, or do any other work on a table. The leg rests also swing away which makes a transfer in and out of it easy. This wheelchair is very sturdy and strong and can withstand constant use for a long time. Despite weighing just 40 pounds, it can carry people who weigh as much as 300 lb. The seat is 18 inches wide and the general dimension of this wheelchair is 31 inches by 26.5 inches by 36.5 inches. This Medline chair doesn’t just function as a wheelchair or a transport chair, it also functions as a rollator. It can be converted from a wheelchair or a rollator in just a few seconds. This means that you do not have to spend money buying a rollator when you have this wheelchair. It can be used for walking, resting and also ride, depending on the situation at hand. The footrest can be adjusted to the side by the push of a button, it can also be locked to the side for easy access into and out of the chair. The upholstery is made of breathable nylon and the height can be adjusted. This wheelchair also has a handbrake. This beautiful wheelchair has extra features such as a cup holder, that can hold a cup or a bottle of water, thereby saving the user the stress of having to go and look for water when he gets thirsty, it also has a spacious basket under the seat for storing necessary items. It also has a side carrying case and strong carrying handles for easy carrying when it is not in use or when the need arises for it to be lifted with a person in it. This wheelchair weighs just 19.5 pounds and has a total dimension of 30 inches by 24.5 inches by 36.5 inches. The rear wheels are 7 inches wide, while the front wheels are 6 inches wide. 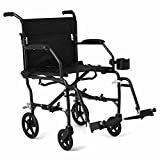 This Medline wheelchair has an aluminum frame thereby making it very light, it weighs just 23.5 pounds. The rear wheels are 12 inches large thereby making it easy for this wheelchair to move outdoor and in uneven terrains. It has a manual handbrake that can be used to lock the rear wheels.This wheelchair has full-length armrests and Detachable footrests as well as a seat belt to hold the user in place and avoid falling over. The upholstery is made of comfortable nylon. The seat has a dimension of 18 inches by 16 inches and the entire wheelchair is 24.8 inches wide and 37 inches high The wheelchair weighs 25.5 pounds and has a maximum weight capacity of 300lbs. It has anti tippers and a push bar with foam to ensure stability. The back of the chair can be folded ( collapsible) this makes it easy to transport or to store. 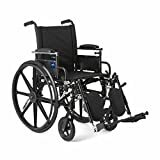 On Amazon.com, this wheelchair has a rating of 4.1 stars out of five stars. This ultralight wheelchair weighs just 15 lbs but it is durable and long-lasting. Despite weighing so little, it has a weight capacity of about 300 lbs. It is also compact in size and easy to travel along with or to store. Moving it around is further made easy with the carrying handles that are attached to it. The armrests are restaurant rattled thereby making it easy for the user to sit closer to desks or takes. With the aid of the Stow-n-go clips, the footrests can be locked on the side of the wheelchair when they are not in use. The frame of this wheelchair is welded with tig and the upholstery is made of nylon. The seats can be increased or reduced by two inches with the help of the Hemi Height adjustable axel. The wheelchair has flip back and desk length arms which makes it easy for the user to navigate it under a table. The leg rests can be elevated and removed easily make the user more comfortable. The height of the back can also be adjusted. The tires are tubeless and east to roll without any fear of it getting flat. Without the leg rests, this wheelchair weighs 33 lb and it weighs 34 pounds with the footrest. The seat depth is 18 inches, while the width is between 18 to 20 inches. The maximum weight capacity of this wheelchair is between 300 to 350 lbs. This wheelchair has a tig welded frame that is finished with grey powder. The height can be adjusted with the help of the axel. The seat is 18 inches wide and 16 inches deep. The arm style can either be moved to be permanent, full-length style or be removable depending on whether the user needs support. The leg rests arm also can be detached or elevated to relieve pressure or prevent swelling. The foot and leg rest swing both ways thereby making it easy to get in or out of the chair at any time. The chair can be easily folded up to conserve space when it is not in use. The seat is easy to clean. It is also very durable. The maximum weight capacity of this wheelchair is 136 kilogram or 300 lb. This Medline wheelchair is indeed robust and Rugged. It has a very solid tig welded frame and good quality nylon upholstery. It has anti-tipping features that makes it very solid and stable even on rough terrains. It has flip back desk arms that make it using a desk convenient for whoever is in it. The height of thus wheelchair can be easily adjusted by two inches (higher or lower) with the help of inbuilt axles. The axel also makes it easy for the rear wheels to be removed without any tools or technical assistance. This wheelchair is MRI compatible and free of latex. The frames and seats are of premium quality and are very durable. The leg rests can be easily elevated or detached. The wheels move smoothly and are easy to maintain Mobility can also be increased by the foot movement of the user. The total dimension of this wheelchair when it is unfolded is 33 inches by 32 inches by 16.5 inches. It weighs 51.6 pounds and has a Wright capacity of 300 pounds. This Medline wheelchair has a seat that is made of nylon and is 18 inches wide and 17 inches deep. The desk length arm makes it convenient to be used on a table or a desk. The leg rests can be elevated or removed. The height of this reclining in a wheelchair can be adjusted from about 18 inches to 20 inches and vice-versa. The back of the chair can be adjusted to a reclining position for Extra Comfort of the user. It comes with anti-tippers which give stability and prevents it from tipping over, thereby guaranteeing the safety of the user when it is being moved on a rough terrain. The maximum weight capacity of this wheelchair is 300 lb. 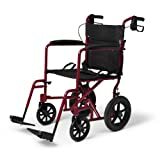 PROPELLING: A major factor that must be considered before buying a wheelchair is whether the chair will be self-propelled or will be propelled by an attendant If you intend to propel the wheelchair by yourself then it is important that you should buy a self-propelled wheelchair that can be moved around without any assistance from anyone. 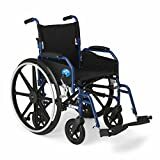 Self-propelled Wheelchairs often have large rear wheels which makes it easy for it to move up a curb and over obstacles, they also have handles at the back, for it to be pushed by someone else in case the need arises. If on the other hand it will be moved about with the aid of an assistant, then go for attendant propelled chairs or transit wheelchair. These types of Wheelchairs have smaller rear wheels which makes it easy for the attendant to maneuver. It is however advisable that whether you need an assistant to propel the chair or you will propel it by yourself, but a self-propelled wheelchair because it offers both options. WEIGHT: The weight of a wheelchair really matters as it affects the ability of the user or assistant to push it. The lighter a wheelchair is the better. Light Wheelchairs are the best because, the weight of the wheelchair, won’t add to the weight of the person sitting it in and this will affect how well and fast it can be loaded. Although light Wheelchairs cost more, they save you the star stress of having difficulty pushing it and maneuvering especially when someone is sitting in. Lightweight Wheelchairs are also easier to move about and transport more than heavy Wheelchairs. Also look out for how many parts of the wheelchair that can be detached. The more the Detachable parts of the wheelchair, the lesser the weight. Most wheelchairs have Detachable armrests and footrest which help to reduce the weight of the chair when it is being transported. SIZE AND WEIGHT OF THE USER: It is important that you put into consideration the size and weight of the user of the wheelchair. Different Wheelchairs have different heights, Seat size and depth as well as different weight capacities. It is therefore important that you take note of the maximum weight capacity of the wheelchair before buying it, this will ensure the durability. The width of the death should also be put into consideration before buying so that the user doesn’t feel cramped and uncomfortable while sitting in it. STORAGE: Go for a wheelchair that can be easily folded and a stored away when not in use. Good Wheelchairs can be folded up by pulling the seat up, some have arms that can be easily dismantled with the lush of a button. Wheels and footrests are also often Detachable without the need for tools. Wheelchairs can be easily folded up, dismantled and assembled are ideal for people who travel or move from one place to the other often. They are also easy to Store and conserved space when not in use. MAINTENANCE AND DURABILITY: Another factor to consider is the ease of Maintenance of the wheelchair and the durability. It is advisable to buy Wheelchairs that we easy to clean and maintain. No flat tires are often the best for Wheelchairs, this will save you the stress that comes with trying to fix a flat tire. Also, buy a wheelchair that has a durable frame and durable seat. There is a possibility that the user will be in it all day, so the seat and the metal frame must be strong enough to carry the weight of the person that will seat in it. 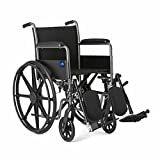 Fifty percent of the users of all the different Medline Wheelchairs reviewed in this article gave them five-star rating out of five stars. This speaks a lot about the quality of the wheelchairs. Medline empathizes with the challenges that come with the inability to use one’s limbs, therefore, they have made the wheelchairs to be as comfortable as you would like them to be. Asides being of great quality, they also come at great prices and most of them are delivered assembled. 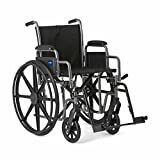 In case you need a wheelchair for yourself or for your loved one, head on to Amazon.com and place an order for any of our top ten Medline Wheelchairs.